It is hard to believe that a year passed since the last Shellabration. Ah, but it’s true. This year, Marian was able to go with me as we “walked the walk” around Greenport village, enjoying local shellfish and North Fork wines. Here is our Sunday, December 7th, mostly in photos. Please enjoy, just as we did. We bought our “Shellabration bracelets” online and picked up them up at the Greenport Brewery. Why the bracelet? When you arrive at a participating restaurant, a quick flash of the bracelet gets you their Shellabration tasting menu and wine pairing. The Brewery featured some delicious raw bar (oysters, clams, and scallops) along with a generous taste of their excellent beer. This was a fine opening to a great afternoon. I remembered last year’s offering at Biere and we headed there directly. Some delicious roasted tomato and red pepper flavored seafood chowder warmed us, and scallops in a mustard seed beurre blanc, and freshly cooked mussels were an amazing follow-up. The wine pairing was One Woman Winery Gruner Veltliner. With restrained grapefruit notes, it was an excellent choice. Read more about our One Woman Winery visits here, and here. Biere is cozy, and was perfect on a cold afternoon. I hear the chef cooks Friday and Saturday evenings. We will be back. This food was delicious, and the chef/owner is a charming gent. Right down the street from Biere is Bruce’s. We planned to visit last summer, but it didn’t happen. Now, we were ready to be dazzled. Seated at the counter, Marian was thrilled to see a young woman sitting nearby us, happily reading a book. No, there was no smartphone evident. A good start. Bruce’s served a seafood torchon. The torchon was delicate and flavorful, much like a seafood foie gras. The wine pairing was a Coffee Pot Cellars Sauvignon Blanc that worked well with the torchon. We were just getting warmed up, and headed over to The Frisky Oyster. Having heard great things about this place, we expected something excellent. The Frisky Oyster delivered. Oysters “Friskafella”, their riff on Oysters Rockefeller, an Oyster Mushroom and Clam Risotto, and Seared Peconic Bay Scallops. The pour was a delightfully dry 2011 Sparkling Pointe Brut. Feast your eyes on the photos following, to see how beautifully our food was presented. It tasted even better. Right around the corner from The Frisky Oyster, just down Texaco Alley, is Go Shuck Yourself. We had a great afternoon here last summer, learning to shuck oysters, but today, Ian Wile and his team were shucking them to order. We had Lucky 13s and Peconic Bay oysters with the delicious accompaniment of Domaine duHaut Bourg Muscadet. What??? How did that French wine get into the act? Who cares, it was a perfect dry partner for Ian’s fresh, delicious oysters on the half shell. There was some Scallop Chowder on offer, but our hearts were set on oysters. They will be open on Wednesday evenings and weekends during the winter. You can be a part of this cozy, friendly scene. Right on Front St. across from The Frisky Oyster is Salamander’s Cafe. Perhaps a minute’s stroll from Go Shuck Yourself, go right in and belly up to the bar. We did, and enjoyed some fabulous Peconic Bay scallops in a Thai coconut sauce, and crunchy fried oysters. We love fried oysters, and these were excellent. A crowd built while we were sipping our Shinn and crunching our oysters, but we were in no hurry. Tough luck guys… we got there first. You know that we will be back here again. The scallops were grand, but oh those oysters. Not long ago, on a beautiful Fall afternoon, we enjoyed lunch here at First and South. That day, we sat out on the deck, but this was an inside day, perfect for two heaping cups of their New England-style chowder, featuring amazing smoked bacon and smoked cod. I had some at last year’s Shellabration, and was eager for round two. We ordered a plate of freshly made french fries to round out this healthy meal. What the heck… ya gotta enjoy life. The pairing was a 2013 Bedell Taste White, citrus and tropical notes dominate, and you get Barbara Kruger’s artwork on the label. Still game for more tasting? We were, so we headed to the Greenporter Hotel for our last Shellabration 2014 stop. 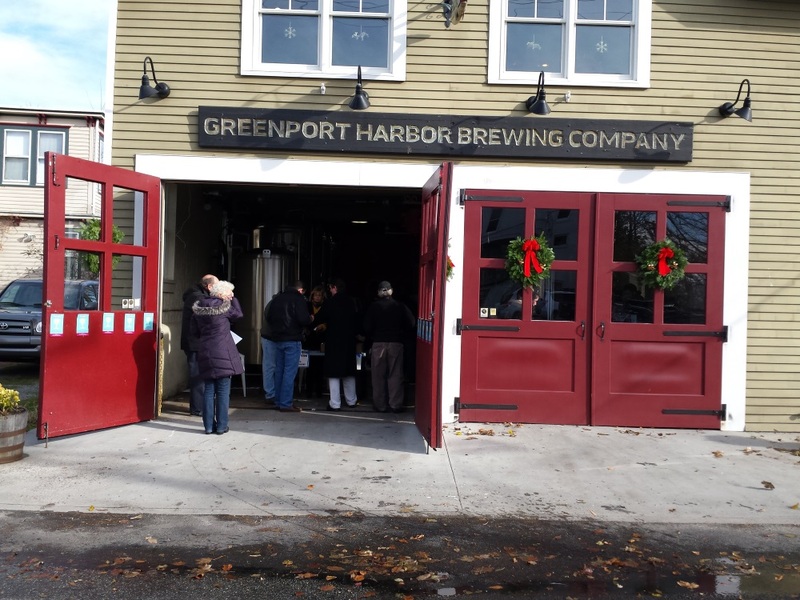 The Greenporter is located at the west end of Front St. so you get a little (1 block or so) time to walk off the last tasting. Their tasting menu included a chowder offering and strip steak, but we went for the Peconic Pearl oysters served on sautéed baby spinach, in a beurre blanc, and sautéed Peconic Bay scallops with local Shiitake mushrooms on a bed of herbed polenta. This food was delicious. Another winner that will lure us back for more. Raphael Vineyards provided the wines, and we selected their tractable Chardeaux, a white blend that works well with seafood and as a picnic wine. Just like Linda Kessler of Kessie did. Eight delicious stops and four hours later, we called it quits and headed home. No worries…your Shellabration bracelet is good for the weekend, so had we ventured out on Saturday too, we might have made it to Scrimshaw, Lucharitos, Rhumbline, Noah’s, Front Street, and The Blue Canoe. Looks like we will have to com back and try again. The holidays are coming, so who knows where we might visit. Until next time, enjoy your trip around town.